Bagru is a small town about 35 kms from Jaipur and lies on the way to Ajmer. It is basically crafts producing center. The unparalleled textile printing of Bagru has made it an important region in Jaipur and beyond. Bagru is well known for hand block printing on cloth known as Bagru prints. This technique employs a wooden block on which the required design is first carved, and then the carved block is used for transferring the motif in the desired colour onto the fabric. This process is most effective for ethnic floral patterns and for printing in vegetable dyes in traditional Bagru Prints. In the past, textiles hand printed by the chippas of Bagru were used to produce fadats, lugdis, angochas, rezais for the local population; faced with a general malaise in demand and an eroding traditional market the chippa community has in the past fifteen years successfully adapted itself to a shifting customer base and altered demand patterns. This openness to experimentation and development has resulted in a resurgence of demand from a cliental that extends from urban to international markets. Both the motifs and the colour palette of indigo, iron black, green, alizarin red continue to follow tradition. However the natural dyes used, have to an extent, been replaced by chemical formulations, though interestingly the traditional process of mordanting and resist remains the same as do the dying stages and the methodology. Printing not only on cotton and silk the chippa community is continuing to experiment with new base fabrics, layouts and motifs. The Chippas settled along the riverside, like any other nomadic settlement. The bank of the river provided then with clay which is an important ingredient in getting the base color of the famed Bagru prints. The artisans smear the cloth with Fuller’s earth got from the riverside and then dip it in turmeric water to get the beige colored background. After that, they stamp the cloth with beautiful designs using natural dyes of earthly shades. Despite all kinds of difficulties, Bagru prints are here to stay, thanks to the ecological consciousness and design innovation that constantly allows it to reinvent itself. Just outside the boundary of the Old City is the Gaiter Village, which has the cenotaphs of the rulers of Jaipur. This Site of Royal Cenotaphs – Gaitor lies in a narrow valley opposite to the Man Sagar Lake, it’s another less visited spot, but don’t miss seeing its fine marble structures. Located in a narrow valley in the midst of glistening yellow sandstone hills, Gaitor was the royal crematorium of the mighty Kachhawa rulers. Gaitor was designated as the royal cremation grounds during the reign of Sawai Jai Singh II. After the capital was shifted to Jaipur, Sawai Jai Singh chose Gaitor as the cremation ground for the royal family. Then from 1733 onwards the final rites of every Kachhwaha king were conducted here. These chhatris are open domed pavilions set on a raised platform. Slender pillars hold up the roof and the platform has smaller chhatris at its corners. The whole scene set between the gardens presents a picture perfect shot. The most graceful and beautiful Chattri at Gaitor is that of Maharaja Jai Singh, Maharaja Madho Singh II’s Chattri is an equally splendid structure that stands two stories high with intricate carvings and delightful motifs. Sawai Jai Singhji’s Chattri has more than 20 carved pillars that add to the beauty and grandness of this massive chattri. It has cenotaphs of all the Jaipur rulers except Sawai Ishwari Singh who was cremated outside the Jai Niwas garden. There are several tiny Chattris that dot Gaitor. These belong to young princes who suffered an untimely death. Sargasuli also known as Isar Lat is a seven storied minaret (tower), which was erected in the mid 18th century in the year 1749 by Sawai Ishwari Singh as remembrance of a battle victory. Sarga Suli which was once upon a time was the tallest building of Jaipur. Locally popular as Isar Lat, this heaven piercing minaret is located at the intersection of Tripolia Bazaar and Gangori Bazaar near the Chhoti Chaupar Chowk and Tripolia Gate. A very beautiful and full view of Old Jaipur(Char diwari Jaipur) can be seen from Sarga Suli. The seven storey minaret was built on the lines of the Qutub Minar and Kirti Stambha of Chittaurgarh. The walls are designed in intricate lattice work which helps to provide air and light to the entire building. The highest point of the minaret is also accessible. Maharaja Sawai Ishwari Singh was ruler of Jaipur from 1743 to 1750.He was born in 1721.He was the eldest son of Sawai Jai Singh II.Maharaja Sawai Jai Singh wanted that Ishwari Singh should rule Jaipur after him.Therefore he got deeds of loyalty signed by his top generals and kinsmen.one of such deeds was signed on January 3,1742, by Thakur of Jhalai,Raoraja of Sikar and Uniara,and Zorawar Singh of Nindar.Rawal Mohan Singh of Chomu also signed this deed.He declared Ishwari Singh “Crown Prince”.Ishwari Singh was made king after Sawai Jai Singh II.But the Maharana of Mewar did not support this. Internal disputes grew up and Ishwari Singh and Madhosingh I were at war.Ishwari Singh defeated Madhosingh I in 1745 with the help of Ranoji Scindia and Malhar Rao Holker. But after the death of Ranoji, his son “Jayappa” supported Ishwari Singh and Malhar Rao Holker supported Madho Singh. Again in 1747 Madho Singh was defeated at “Rajmahal” near Deoli Rajasthan. Marathas did not render this help without reason. They used to collect “Chauth” and “Sardeshmukhi” texes totalling about 35%of state income in lieu of their support and services. Scindia and Holker were against each other and therfore Maharana of Mewar called Peshwa to intervenue himself. Peshwa arrived himself and at Niwai it was agreed that Madho Singh be given four Parganas. However Ishwari Singh was not present in person in this settlement because he started suspecting the Marathas of their intentions. Peshwa returned in June 1748 and after his return Ishwari Singh did not fulfill the settlement. Again in rainy season of 1750, Maratha army came to Jaipur to recover their taxes. Holker and Scindia got a commitment from Ishwari Singh to pay Rs200000, but this was beyond the capacity of Ishwari Singh. He could not pay the amount and committed suicide on December 12,1750, by taking poison and bitten with a “Cobra” with three of his wives and one concubine. Next day 20 of his wives died . Madho Singh was made king but public of Jaipur was so infuriated with this incident that on January 20,1751 all gates of Jaipur were closed and Marathas were butchered inside the city.Almost three thousand Marathas died and 1000 injured. But the Scindia and Holker were away in “Doab”. Later Jayappa Scindia was murdered in Nagaur, while trying to collect the hated taxes. Jaldhara is an initiative taken by the Jaipur Development Authority to preserve the good things about the nature. Jaldhara is a wonderful water fountain in Jaipur. It is located in the city center at Kulish Smriti Garden on JLN Marg Jaipur. This fountain is spread across a garden across half a kilometer starting from OTS circle to Dainik Bhaskar office Jaipur. Jaldhara is a 40 ft high fountain surrounded by various trees and artificial rocks. The garden running along the fountain has statues of dolphins, cages of artificial birds and animals and artificial crocodiles and tortoise placed in the water pond of Jaldhara giving a feel of a Zoo. The fountain Jaldhara is lighted in the night and two more lightings fountains are also present in the garden giving an excellent look during nights. The park here has provisions for visitors to sit on benches and small huts that provide cool shade during summers. This fountain park has become a favorite of every Jaipurite since its opening and it is equally popular with the tourists. 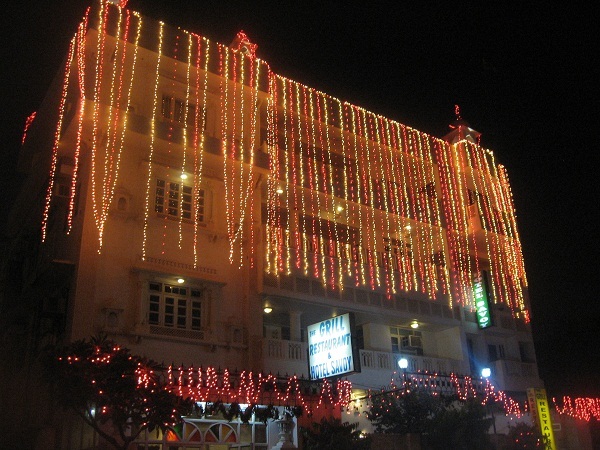 Kapoor Chandra Smriti Van is located on JLN marg -one of the best roads of Jaipur. 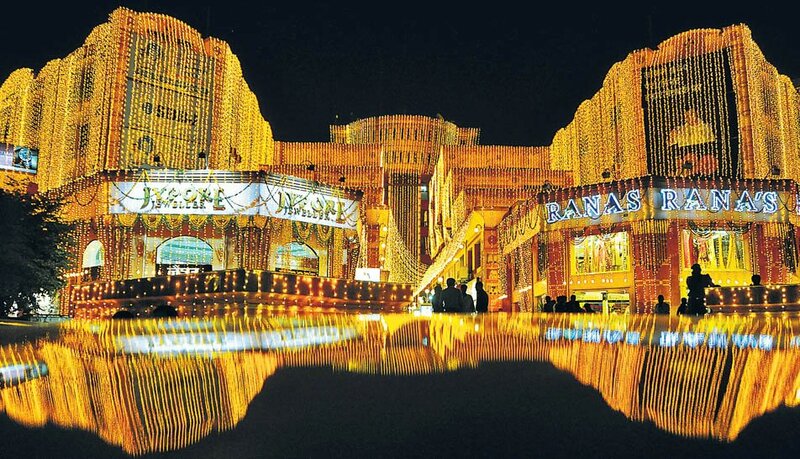 It is spread over 108 acres in the city itself – approx. 5 km from the center of the city.It is a bio diversity forest. It was thrown open to the public few months back. The concept was funded by the rajasthan patrika group, and hence named after the founder of the rajasthan patrika – Mr kapoor chandra kulish.The huge hoarding outside the entrance bears his picture.the park is a joint venture between Jaipur Development Authority and Dept. of Forest. Smriti Van is not really lush with greenery. Rather it is an amalgamation of old trees with lot of new plantation.new plantation includes lots of shrubs, creepers, flowers and few trees as well. One cannot fail in noticing that almost all trees are not new plantation except for many of “champa” trees which one can find in abundance. It open in the morning at 9.00 A.M. and closed at 5.00P.M. There is no time boundation to stay here . You come here in group or alone for picnic . It has fully natural environment , like green trees , grass , birds , flowers etc.